I made notes during the week so I would remember some of the funnier things that happened. I just looked at that list and I don't know what any of it means! Let's start off with a picture. These mermaids are not swimming. They are being punished. Harsh. Thanks to my sister, Joanie, who has been doing genealogical research on my paternal family tree, I have learned that I am a descendant of a Mayflower passenger named Resolved White. My mind is officially blown. I can't wait to learn what other awesome things she discovers about our family! I also learned that we are related to Will Turner from Pirates of the Carribbean! Oh. He's fictional. We are related to a real William Turner from Virginia, so that's good too. Annie-Mae is saying "Mom"! I don't know if she knows it's me, but still, it's a step closer and it's adorable! It's her 4th word. Here are her words: "Hi", "Yes", "Please", "Mom". Cute!!! At the Brownie camp-out last week, I got to know some of the other moms a little better. Who am I kidding, many of them I'd only ever said, "Hi" to and some I'd never met. So it was a fun night. One mom and I got to have a conversation about New York City, a topic I rarely get to talk about with anyone who knows anything about it. Since Kevin and I spent 6 years of our marriage and started our family just outside of the city, it's a place that will always be special to me. I'm coming to grips with my homebound lifestyle again. Since Anne-Marie was born, I've had to stop with my big outings to the zoo and the pool because she needs her naps and will only sleep in her crib. The most high maintenance baby of the 4, she is under the impression that she is an only child and the world revolves around her. We've been spending our hot summer days in the backyard baby pool and swing set. I was worried that the kids were feeling lonely for their friends since most of our friends don't have babies. They seem fine. I think it's just me. I'm an extroverted person, not that I'm not shy sometimes. I feel rejuvenated after spending a couple hours with friends, even if it's just sitting around watching the kids play. I've come to accept that I have reentered that lonely state in life again. But instead of being depressed and feeling like no one loves me (I hope I'm not sounding whiny. I have my moments), I have found ways to occupy my time. Most of these things are projects around the house, but also this blog. It feels less lonely knowing there are people reading my blog who know what I'm talking about. Thank you to you all! I bought an apron from Boojiboo on etsy.com yesterday. I'm so excited! I can't wait till it gets here. I bought only one, but there were several that I loved. I decided that I will try out one and if I like it, I'll go back and get some others. The grease and filth on my shirts has decreased significantly since I started my habit of apron wearing. I feel so on top of things when I'm wearing an apron. I don't know why. My only concern is that this apron is so cute, I'll get upset if it gets dirty. That would, of course, defeat the whole purpose. The kids start their ice skating lessons tomorrow morning. 45 glorious minutes inside a refrigerator when it's 92 degrees outside make my decision to take ice skating lessons in the summer a pure genius move. Don't worry, I didn't break my arm just then. I guess you'll be seeing my kids in the Winter Olympics in 2018. Mine will be the ones with the gold medals in hockey and figure skating draped around their necks. Not that I have high hopes at all. Would you like to get in on 7 Quick Takes? 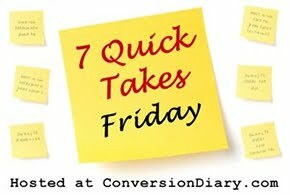 Visit Jennifer at Conversion Diary to read more and better Quick Takes and link to your blog. I need an apron so so bad, I stain all my light colored shirts with spagetti sauce, and splatter grease on all my dark colored shirts. It's terrible! I know exactly what you mean! Dawn is my best laundry friend. Of course your baby knows that "mom" is you! My sisters convent makes matching mother daughter aprons, wish they would get an online store up and running, not sure what the hold up on that is.